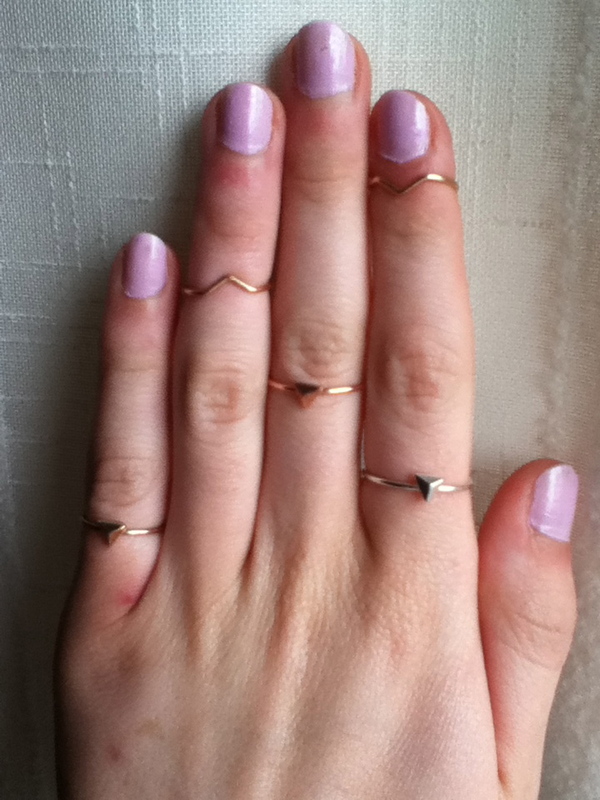 I am completely head-over heels besotted and in love with these midi and finger top rings from River Island. I've loved this little trend since it emerged during Spring 2013, and after looking for a simple style with an affordable price tag I finally bought these beauties! They add a subtle, dainty yet edgy touch to the most basic outfit and enhance the overall look without stealing all of the attention like a statement cocktail ring (which I love too, don't get me wrong!). The plain and pyramid studded bands are available in a pack for €4, and the two arrow finger top rings are a steal at just €2! I cannot stop wearing these. It's a problem! They just go with everything, wether I'm dressed up for a night out, or having a lazy day in basic a t-shirt and jeans combo. Go and pick up a set from River Island before they sell out, I might even buy a second set! :P I also really like this new nail varnish from NYC called 'Lavender Cupcake'. I'm trying to stick to pastels since I'm trying to hold onto the summer forever! I can't help but be drawn to darker colours though! It's a really strong formula and gives a lovely thick, opaque finish with two coats. It claims to be chip-resistant for 10 days, and although I wouldn't agree that it possesses those magical powers, overall it stayed intact really well, and I had to apply another coat after 5 days. Which is actually pretty impressive considering I work part-time in a book shop!